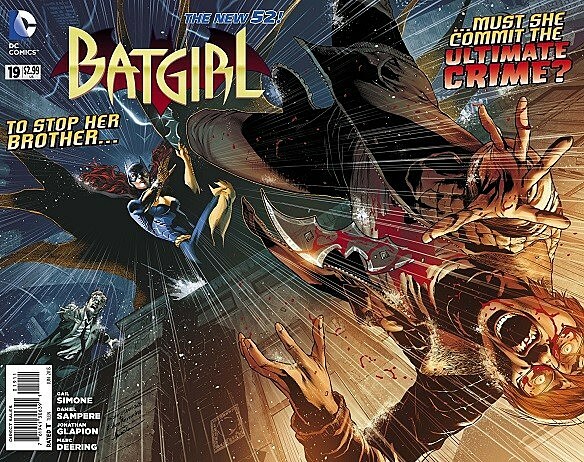 The sibling conflict teased on the cover of Batgirl #19 may be the hook that pulls readers in, but it will be another reveal in the issue that will occupy a spot in comics history, as one of the book's characters will reveal she is transgender, the first time a character has done so in a mainstream superhero comic. Wired reports that writer Gail Simone was inspired to create a transgender character by a conversation with Batwoman co-creator Greg Rucka at Wondercon a few years ago. Simone asked why there seem to be fewer gay male comics characters than lesbian heroes (such as Batwoman). Rucka replied it would be a huge sign of progress for a gay male character to appear on a comic cover. It'd be even bigger if the character was transgender. Find out just who will be revealing her transgender status in the book, as well as have a look at the full cover to Batgirl #19, after the jump. Alysia Yeoh, the young woman dating Barbara Gordon's psychopathic brother James Jr., reveals she's transgender in a conversation in which Barbara opens up and discusses her former status as a paraplegic. Simone said DC Comics Co-Publisher Dan DiDio didn't take much convincing to give the character the go-ahead in a lunch meeting. "He just paused for a moment, asked how this would affect Barbara's story, and immediately approved it," Simone said. The writer said she plans to add another transgender character to a different comic she's writing, though she couldn't say which one. Yeoh is also bisexual, Simone said. Simone acknowledged that characters in independent and mature-readers titles have been transgender, and some superhero comics characters have changed their gender characteristics through magical and science-fictional means. "Those characters exist [and] that's great, but I wanted to have trans characters who aren't fantasy-based," she said. For the full interview and full pages from the issue, head over to Wired. Batgirl #19 is available in comic shops and on ComiXology today.